An earthquake is the sudden release of stored energy. Earthquakes occur when the rocks across a surface, called a fault, shift rapidly relative to one another. This slippage disturbs the material around and emits seismic waves that radiate outward and shake the ground. The shaking is usually too small to be felt, but occasionally large earthquakes produce very strong, hazardous ground shaking. The types and frequency of earthquakes depend on the geological environment. 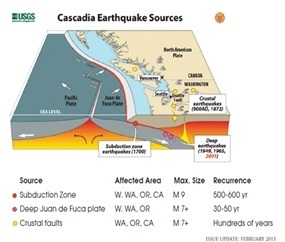 Washington is part of a subduction zone, in the geologic region known as Cascadia. Here two tectonic plates, the Juan de Fuca and North American plates, move toward one another. Because the Juan de Fuca plate has denser oceanic crust it sinks and slides beneath the North American plate (which has lighter continental crust). This results in three types of earthquakes: those within the sub-ducting plate (typically deep), along the interface between the sub-ducting and overriding plates, and within the overriding plate (shallow) just beneath us. 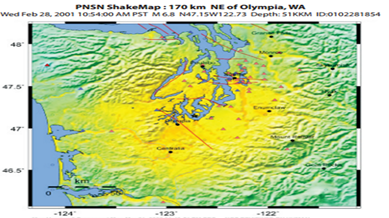 While most earthquakes occur in Western Washington, some damaging events also occur east of the Cascades. Washington has a history of frequent earthquakes. More than 1,000 earthquakes occur in the state each year. A dozen or more are strong enough that people feel ground shaking. Occasionally, earthquakes cause damage. As yet, no reliable precursors to earthquakes have been found that would make prediction of the precise time and place of a future event possible. However, significant advances have been made in understanding how and why earthquakes occur and the impacts they may have on our environment. The Earthquake Notification Service (ENS) is a free service of the U.S. Geological Survey that sends registered individuals automated notification emails and text messages when earthquakes of magnitude 6.0 or greater occur. When an individual registers to receive the notifications, he/she can customize these settings and criteria to better fit their needs. For example, one criterion that a user can specify is the magnitude range of events they want to be notified about. Information for earthquakes in the U.S. is generally available within 5 minutes; information for earthquakes elsewhere in the world is generally available within 30 minutes. The PAGER system provides fatality and economic loss impact estimates following significant earthquakes worldwide. PAGER results for earthquakes occurring within the last 7 days are contained below. The earthquakes are color-coded by the higher of two impact scales - fatalities and economic losses. These impact scales are broken up into four categories. Green alerts are issued when our models estimate zero or very minimal human or economic losses. Yellow alerts are issued when our models estimate up to 100 fatalities, or up to 100 million dollars in losses. Orange alerts are issued for estimates of up to one thousand fatalities, or one billion dollars in losses. Red alerts are issued when either fatalities or losses are predicted to exceed one thousand fatalities or one billion dollars in losses. Active Faults When an earthquake that might generate a Pacific Coast tsunami is detected, the West Coast/Alaska Tsunami Warning Center calculates the danger to the northeast Pacific Coast and notifies the communities at risk. If the earthquake occurs off our coast, however, there may be no time to send out hazard warnings and may make alert and notification systems inoperable. Pictured below is a map of the active faults throughout western Washington. 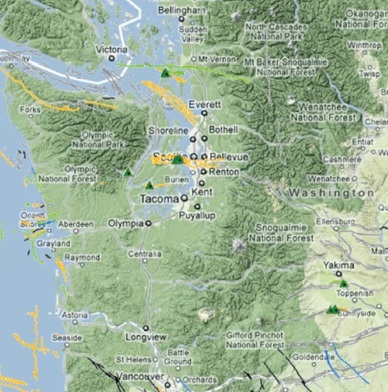 On the USGS website, you can view Washington State’s faults here (sample below). Shake Map sites provide near-real-time maps of ground motion and shaking intensity following significant earthquakes. These are based on actual measurements of the ground motions. These maps are usually available within ten minutes of an earthquake. ShakeMaps are constantly updated during an event, resulting in multiple versions, as time goes on downloadable archived. Magnitude describes the size of earthquake based on amplitudes of the seismic waves it radiates. Intensity measures the impacts of an earthquake at a particular site, which depends on the magnitude and also on the distance from the earthquake and other factors. Magnitude and intensity measure different properties; magnitude describes the size of the earthquake and intensity describes its impacts at a particular location. Magnitude is related to the amount of energy released by the earthquake source. It is usually determined by measuring the amplitude of the earthquake waves recorded by a seismograph, with corrections applied to account for the energy lost as the waves travel to the seismograph’s location. Magnitude should therefore be independent of where the measurements are made. Different types of magnitudes may be estimated and reported because the types of waves measured or methods used may differ. ‘Richter’ magnitude refers to a method used for smaller earthquakes recorded locally, and the most commonly reported type now is the ‘moment’ magnitude. While magnitudes are designed to agree with one another sometimes they may differ by a few tenths or more. This does not mean either one is incorrect, but just reflects the imprecision of the estimates. Intensity is a qualitative measurement of the impact of an earthquake at a particular site. Although the intensity reported at a site depends on the earthquake’s magnitude, it also is affected by the distance from the earthquake, the local conditions, and even when and who is recording the impacts. Intensities are measured based on human perceptions of earthquake impacts at a particular location. A commonly used intensity scale in the U.S. is the Modified Mercalli Intensity Scale (see illustration). The highest intensities are not always measured near the earthquake epicenter and lower intensities are not always measured farther away. Roman numerals are used to describe intensities to distinguish them from magnitudes. Empirical relationships between intensity values and various shaking levels and the amount of damage experienced at the measurement site have been derived. Shake Map and Did You Feel It? Maps use these relationships to convey instrumentally measured shaking levels in terms of their likely impacts. Subduction zone earthquakes occur within the sub-ducting Juan de Fuca plate. Stresses build inside the sub-ducting plate as it blends and pushes its way into the Earth. Some intraplate earthquakes occur far offshore near the spreading centers and transform faults that form the western edge of the Juan de Fuca plate, but are not hazardous because of their distance from land. The hazardous intraplate earthquakes typically occur where the plate has reached about 30 km (18.6 miles) depth and are beneath land. Although intraplate earthquakes are the most frequent (e.g. M>6 events happened in Puget Sound in 1949, 1965, and 2001), they tend to be less damaging because their depth make them farther away. The largest deep intraplate earthquakes likely would not exceed M~7. They also tend to have few or no aftershocks. Deep earthquakes result from friction and other forces along the uppermost section of the interface between the sub-ducting and overriding plates impede subduction. This ‘locked zone’ of the plate interface is a giant fault, capable of producing giant earthquakes often called ‘megathrusts’ (the overriding plate thrusts over the sub-ducting plate). The plates continuously move toward one another at a rate of about 4 centimeters/year (1.6 inches/year), building stresses along the locked portion of the plate interface. Over hundreds of years enough stress has built that the locked interface breaks. The meters of relative motion across the fault that should have occurred while it was locked take place within just hundreds of seconds, releasing all the stresses and radiating seismic waves. In Cascadia the last megathrust was in 1700, and megathrusts recur every 500 years on average in the northern half of the region, and possibly more often in the southern half. Shallow earthquakes occur within the crust of the North American plate. The relative motion affecting the North American plate squeezes it in a north-south direction at a rate of about 4 millimeters/year (.16 inches/ year), so damaging earthquakes on any particular fault recur at intervals of thousands to tens of thousands of years. Because there are lots of crustal faults located just beneath the surface, the hazard is significant but localized near the fault. What are aftershocks? Aftershocks are earthquakes that follow the largest shock of an earthquake sequence. They are smaller than the main shock. 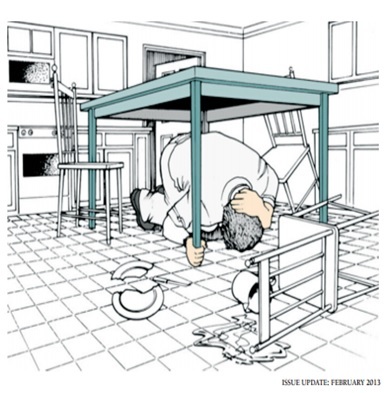 Aftershocks can continue over a period of weeks, months, or years. In general, the larger the main shock, the larger and more numerous the aftershocks, and the longer they will continue. Use Drop, Cover, and Hold On. What is “Drop, Cover, and Hold On”? • Hold on - in case the object you’re under moves, close your eyes - you’ll do better psychologically if you don’t watch, and you’ll protect your eyes. Studies show that people in our country tend to be hurt by falling objects, not collapsing structures. If you are on your feet trying to move, you are in danger from toppling bookcases, breaking windows, flying dishes, falling televisions, collapsing fireplaces, or shifting furniture. Safety comes from quickly getting to a place of safety. Be prepared for an earthquake. • Anchor appliances and tall heavy furniture that might fall. Put latches on cabinet doors to keep contents from spilling out. • Establish an “out-of-area” contact and keep the phone numbers handy. This is the person family members will call if you are separated. • Have a place at home where emergency supplies are kept and tell others where it is. • Stay inside. Move under a desk or sturdy table and hold on to it. If it moves, move with it. Stay away from windows, bookcases, refrigerators, heavy mirrors, hanging plants, and other objects that could fall. • Do not go outside until the shaking stops. • If you are in a theater or stadium, stay in your seat, protect your head with your arms. Do not leave until the shaking stops. • If you are outdoors, move to a clear area away from trees, signs, buildings, or downed electrical lines. • If you are on a sidewalk near a tall building, get into a building’s doorway or lobby to protect yourself from falling brick, glass, and other debris. • If you are driving, slowly pull over to the side of the road and stop. Avoid overpasses, power lines, and other hazards. Stay inside the vehicle until the shaking stops. • If you are in a wheelchair, stay in it. Move to safe cover if possible, lock your wheels and protect your head with your arms. • If you were evacuated, wait until you are told it is safe before returning home. • Be careful entering buildings. Stay away from downed power lines. • Check yourself and those around you for injuries. • Be ready for aftershocks. • Do not use the phone. Call 9-1-1 only if it’s an emergency. • Do not drive unnecessarily. • Check on neighbors, particularly elderly or disabled persons. • Try to contact your out-of-area phone contact. • Listen to your radio. • Do not rush to school to pick up kids. Electricity sparks have the potential of igniting natural gas if it is leaking. It is wise to teach all responsible household members where and how to shut off the electricity. • Locate your electricity circuit box. • Teach all responsible household members how to shut off the electricity to the entire house. • FOR YOUR SAFETY: Always shut off all the individual circuits before shutting off the main circuit breaker. Natural Gas Natural gas leaks and explosions are responsible for a significant number of fires following any major earthquake. It is vital that all household members know how to shut off the natural gas. • Shut off the gas immediately only if you smell the characteristic odor of gas, you hear a hissing sound, and/or you notice the meter dials spinning more rapidly than normal. • Do not use matches, lighters, open flame appliances, or operate any electrical switches until you are sure no gas leaks exist. Sparks from electrical switches could ignite the gas. • If you smell natural gas, immediately get everyone out of and away from the house. Open the windows and doors to provide ventilation. Shut off the gas meter. 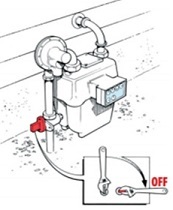 • Locate the shut-off valve (see illustration). Water quickly becomes a precious resource following many disasters. It is vital that all household members learn how to shut off the water at the main house valve due to possible contamination. • Make sure this valve can be completely shut off. Your valve may be rusted open, or it may only partially close. Replace it if necessary.